The Gunpowder River is clear and flowing at 82 Cfs and is 56 degrees F. With ideal flows and water temps in the mid to high 50’s wild fish are looking up. Fur ants and low water caddis have been effective this week. Long light leaders are still making a difference out there. Nymphing is getting a bit tough with lots of leaves about. Thanks to Kerrie for joining me on the stream in mid-September and giving me the OK to post some feedback and pictures from our trip. Thanks again for guiding me yesterday.I had an absolute blast and learned a lot. Please do send the photos when you get a minute and please set aside a few of those white rabbit hair streamers for me on Friday! I will come pick them up Saturday morning! This entry was posted in fishing report on October 18, 2013 by Theaux Le Gardeur. 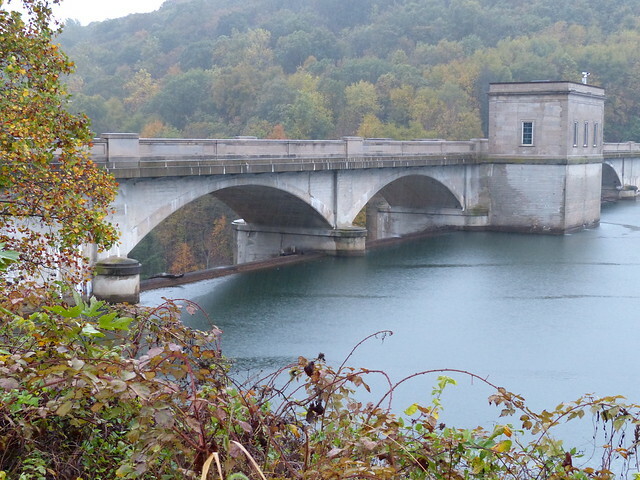 A full Baltimore City Reservoir and a Nor’easter that brought rain to the Hereford Zone last evening through today combined to create a spillover event at Prettyboy Dam. 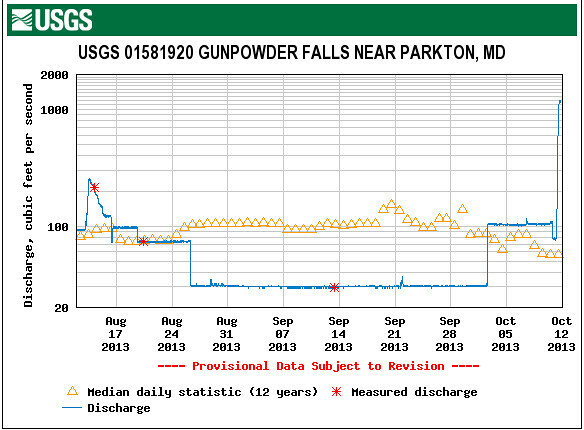 The Gunpowder River flow rose from 75 Cfs to over 1,190 Cfs. Water temperatures also moved up sharply from 56 to 66 F. This photo taken last night shows a full Reservoir while the storm approached the area. 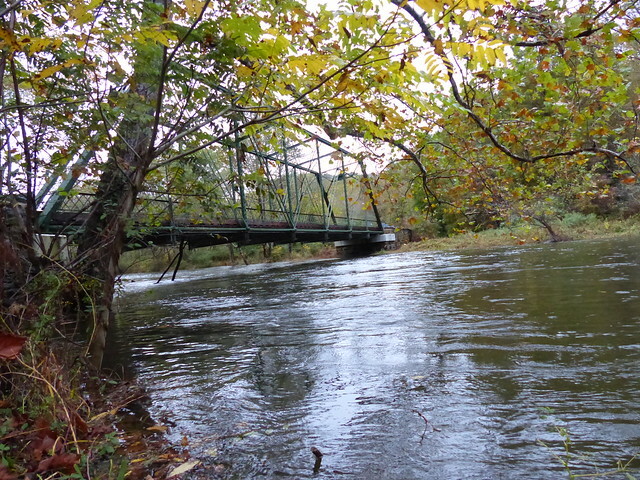 With relatively no freeboard (or buffer) at Prettyboy Dam, and heavy localized rainfall, spillover and related severe flooding occurred throughout the Hereford Area of Gunpowder State Park impacting the riparian habitat of the Gunpowder River. For weeks the River level has been shin deep (at 29 to 31 CFs) through the Park, making it very difficult to float the River without dragging canoes and kayaks over exposed gravel bars. The USGS Hydrograph (read from left to right) illustrates River levels in cubic feet a second (Cfs) at close to median flows (in line with the triangles), low flows (below the triangles), and finally spillover and flooding. That Baltimore City DPW manages Gunpowder River levels to maintain a full Prettyboy Reservoir during Hurricane Season is troubling. This practice has led to significant flood events in the fall of each of the past three years. (Please see related posts below). Impacts of flooding are at odds with both the Baltimore City Watershed Agreement that promotes “existing environmental, wildlife-habitat, and aesthetic purposes, as well as beneficial recreational uses” and the Loch Raven TMDL (Total Maximum Daily Load) which was established to “achieve and maintain water quality standards including designated uses” and protects the downstream drinking water supply reservoir from sediment and phosphorus pollution. This entry was posted in news on October 10, 2013 by Theaux Le Gardeur. The Gunpowder is flowing at 104 CFS is clear and 56 to 58F. With River flows and water temps up, wild fish don’t have nearly as long to study flies and they will be snapping at well presented dries. For now, plan on ditching the 7 and 8x and enjoy fishing some more reasonable ( 9 ft 4 and 5x) leaders and tippet (5x and 6x) for now. 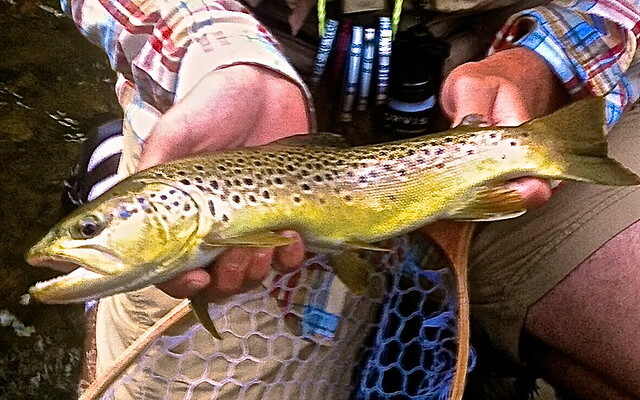 Larger hopper patterns and heavy streamers will account for a number of fish at these flows. Nymphing with some shot and a double nymph rig-like a copper John followed by a small hare’s ear will do the trick. For dry fly fisherman, tricos, BWO’s and small stoneflies are still part of the mix-spend some time in back eddys fishing these small flies to rising fish. 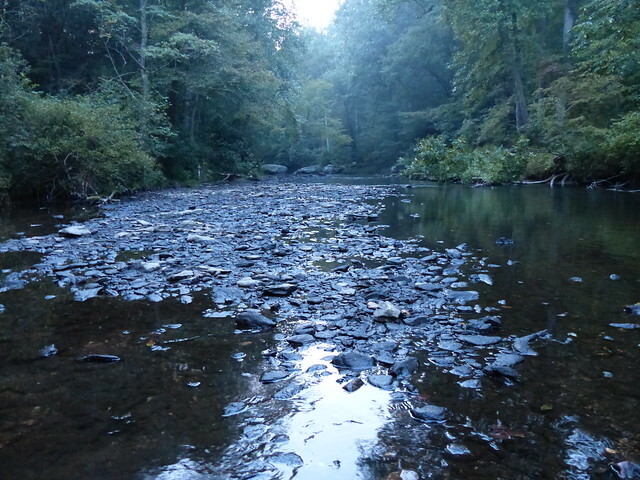 My name is Joe Irby, and I recently fished the Gunpowder River for the first time ever. 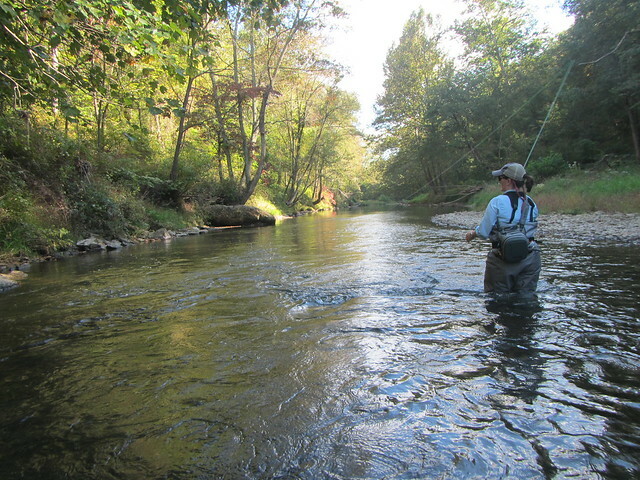 I am really good Friends with Alex Mccrickard, we went to Sewanee together, and he actually taught me how to fly fish. Because I have done a lot of fishing with McCrickard, I have heard TONS of stuff and seen a lot of pictures of the fish that he has caught there. So this past Sunday, another buddy of mine made the hour trip from Alexandria, to the Gunpowder. We had no real idea where we were going and just found a spot where to road crossed the river. I came to a deeper pool with a nice riffle a couple hundred yards upstream from the bridge. About my third cast into this riffle, I hooked into something that I thought it may have been a smallmouth at first, but after a couple minutes of fighting this fish, I was surprised to see a nice, long, brown trout. 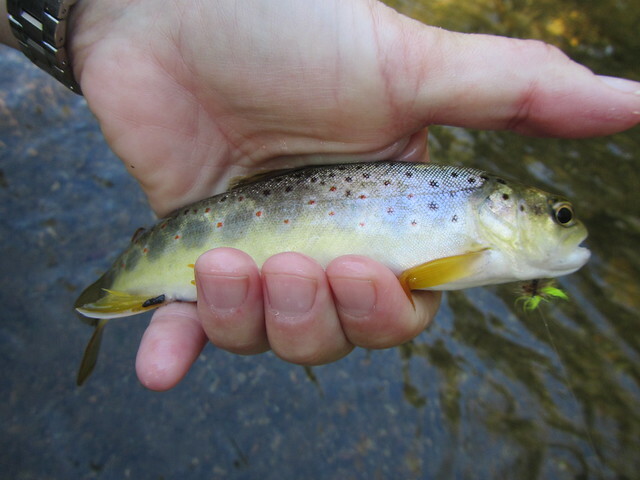 I am from western VA, near Lexington, so I catch a lot of bows, but unless I want to spend all day on my hands and knees at Mossy Creek, there is nowhere to catch nice brown trout. So when I saw this fish, I was beyond excited. It was the only trout I caught that day, but I will definitely be returning soon. In short, I sent photos of the fish to Alex and he said it was a nice fish for the Gunpowder. He told me to get in contact with Theaux and to send the photos to y’all. I didn’t measure the fish and I put it back pretty quickly. The photos aren’t great quality, but he said y’all may want to put them up on your site (which is awesome by the way, I had never checked it out before and since I’ll be on the Gunpowder more this year, I will absolutely be frequenting the page.) Feel free to use them how you see fit. This entry was posted in fishing report on October 5, 2013 by Theaux Le Gardeur.